We are very proud of our Changing Room and toilet facility which, due to the campaigning efforts of local mum Sarah Brisdion, is available for those of our visitors who have need for specialist adult-sized changing equipment. 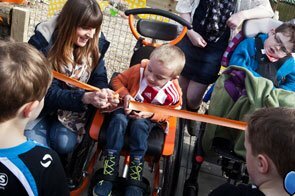 The facility was officially opened by Sarah’s son Hadley (aged 5) and friend Sam Burnage (aged 9). The Changing Room facility contains specialist equipment that includes an adult-sized, height-adjustable changing bed, lifting hoist, and adapted toilet. It gives visitors who have registered physical needs the dignity and privacy that most people take for granted. Sarah’s 5-year old son Hadley, who has cerebral palsy, is often faced with the undignified and unsanitary situation of being changed on urine-soaked toilet floors because standard toilets simply don’t meet his needs. As a result, Sarah is campaigning for better disabled toilet and changing facilities in public places on behalf of Hadley and 10 million others in the UK who have additional needs. Working closely with Bryan and Dawn Pass, owners of Longdown Activity Farm, Sarah organised a fun ‘Dung Heap Challenge’ which raised an impressive £4,000 through the efforts of local sponsors and friends. She also approached The Barker-Mill Foundation who kindly donated a further £2,500. These funds enabled Longdown Activity Farm to build the important facility. The Changing Room facility is available to all individuals visiting Longdown Activity Farm who have a registered disability or who have a need for the equipment.